Why is Cristiano Ronaldo feeling 'sad' at Real Madrid? Real Madrid must be sick of the sight of Granada. On Sunday evening Jose Mourinho's side demolished the Andalucians 3-0 at the Estadio Santiago Bernabeu, just as they had on their last visit in January. 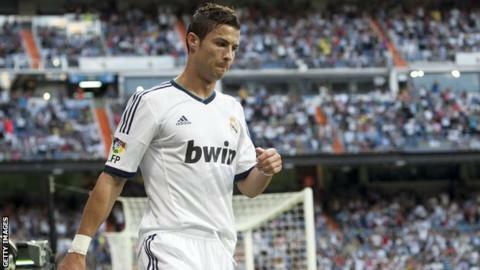 Yet - in an identical script to that occasion last winter - Cristiano Ronaldo declined to celebrate his two goals. Ronaldo cut as peeved a figure in front of journalists after the game as he had in front of his public on the field. He said he hadn't celebrated his goals as he felt "sad" due to his "professional" situation at the club. Plenty has changed in the intervening eight months since Granada were last in town - most notably, the fact that Ronaldo helped Real Madrid win back La Liga from Barcelona. What hasn't changed is Ronaldo's salary, despite a contract extension being mooted as long as six months ago. Ronaldo, 27, says his current mood is "not about the money," but you can bet your last euro that it is at least a little bit about that. A table of the world's best-paid footballers published in Marca this week showed Ronaldo in 10th place, mainly due to lucrative moves for Samuel Eto'o, Sergio Aguero, Didier Drogba and Zlatan Ibrahimovic in the last year. He's telling the truth in that it's not really about the money itself, but rather about the respect it implies. Ronaldo is particularly infuriated that he is on the same wages as Kaka (£8m annually), despite the fact that the Brazilian is far from essential to Mourinho's plans. For the very cream of world football, that's what it's all about. Rather than defining whether you can afford to buy 20 Maseratis or 30, your pay slip is acknowledgement not just from the club, but in terms of status in the dressing room. Real's president Florentino Perez has been here before. Claude Makelele left for Chelsea in 2004 and Patrick Vieira pulled out of a 2005 move from Arsenal at the 11th hour because both were not considered worthy of joining the top bracket of salaries at the Bernabeu. They weren't 'shirt sellers'. The current situation is a legacy of the second coming of Perez. In his first spell as president, he ushered in the galáctico era by signing the likes of Luis Figo, Zinedine Zidane and David Beckham. When Perez got a second crack at the top job in 2009 he quickly made his transfer policy from the previous era look circumspect. He signed Manchester United's Ronaldo for £80m,Liverpool's Xabi Alonso (£30m),Kaka (£56m) and Karim Benzema (£30m). In Ronaldo's mind, he is getting no credit for everything he's done since he arrived three years ago. The other side of that argument is that Real Madrid don't have the money to give their star a big raise while they're still lumbered with Kaka's wages - a point made by Spanish daily As this week. There are other potential strands of discontent. Ronaldo's relationship with his team-mate Marcelo has reportedly degenerated, and he is also upset with what he regards as the unfair treatment of his close friend and Real Madrid and Portugal team-mate Fabio Coentrao. It is felt that the Madrid press often have a dig at midfielder Coentrao, who is seen as a soft target, when they want to get at Mourinho or Jorge Mendes, the Portuguese super-agent both players share with their coach. Mendes' other clients include Manchester United's Nani and Anderson. Mendes and Ronaldo may try to use moneybags Paris Saint-Germain as leverage, as a potential destination with the cash to satisfy their wishes. The French club, who were taken over by Qatari investors last year, are perhaps the ultimate bogeyman in world football today, just as Manchester City were before them. Taking on Real Madrid in a PR battle is, however, brave to say the least. The pro-Madrid press are already moving into position, tentatively suggesting Atletico Madrid striker Radamel Falcao as a nominal replacement. The timing of the 26-year-old Colombian taking Chelsea to pieces in the European Super Cup is opportune for the top brass at the Bernabeu. Marca today quoted Radamel Enrique Garcia King, Falcao's father, as saying "my son's dream is to play at Real Madrid. Ever since he was little, he's wanted to play there." The player himself said he just "wants to continue winning trophies with Atletico," but it is easy to see his appeal. Deeply religious, Falcao is humble and approachable as well as prolific. Ronaldo is high maintenance. Yet despite the offering of the concept of taking on Falcao, Real Madrid do realise that no one player can replace Ronaldo - goalscorer, creator, winger and number nine all rolled into one. What the club are saying is that they have no intention of being held to ransom. Real Madrid and Cristiano Ronaldo are two of the boldest brands in the game. It remains to see who will blink first.